Arif Azim Co. Ltd. is a national company operational in Afghanistan since 2003. The company has its main office in Kabul and four regional offices in major provinces of Afghanistan. The company is presided over by Mr Hajji Mohammed Arif Azimi. He has over 35 years of rich business experience prior to establishing Arif Azim Mr Azimi has run various businesses such as automotive & automotive accessories agencies, electronics distribution and fruit processing. The Arif Azim Co Ltd and other ventures of Arif Azim have invested $24 Million till date and Azimi family’s net worth is of $ 14 Million in form of assets. 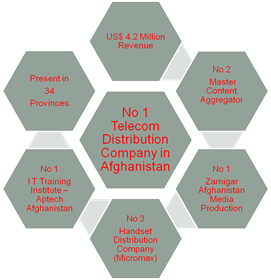 Arif Azim Co Ltd commonly known as Arif Azim is Afghanistan managed telecommunications Services Company headquartered in Kabul and is the Afghanistan largest mobile telecommunication distribution company, large by retailers with over 6,000 across 34 provinces as of July 2013. Arif Azim has network in all 34 provinces in which it operates, providing the distribution services for Roshan, Etisalat and Micromax Handsets. Arif Azim is a serious player in the VAS space, both in terms of platform and content aggregation, particularly integrating services at the platform stage. With on-going partner ships with Roshan and Etisalat. The company partnership with Global VAS players such as Spice Digital, Hungama will see offerings, as these being introduced in the Afghanistan telecommunications market. It is the largest distributor for Etisalat with 1,200 retailer base as of Nov 2013. Arif Azim is the largest distributor for Roshan under Zarnigar Telecom brand, having direct presence in all seven main regions with a retailer base of 1,600 retailers– Kabul, Mazar, Herat, Kandahar and Jalalabad, Kunduz and Ghazni . It has direct and indirect presence in all 34 provinces across Afghanistan through Regional Resellers. Arif Azim is the largest provider of cable service in Kabul, offers cable services under the Zarnigar brand, and is headed by Ahmad Rashed Azimi. Zarnigar Cable Network also presides over the All Afghanistan TV Cable Network Union, Connected over 35 cable operators in Kabul using a fibre optic backbone so as to provide uniform coverage across Kabul.